Another good lesson today. I’ve been a bad student and not been calling for a weather briefing lately. I’ve just been going off aviationweather.gov and faa.gov for weather and TFRs. I hate talking on the phone, but with a pep talk from EB about how nice they are, I called. He was nice, they are nice! The man I spoke to was very nice. Glad I did it. It was a bit windy so we didn’t do an entire lesson with touch and goes but went to the north practice area again and worked on my stalls again. I got a lot better. I was really focused today and I don’t believe I realize how much focus I needed in the first place. I almost got my power off stall into the correct limits. It’s just a lot more back pressure than I realized. Maybe I should do a few push ups to work on my scrawny arms. I got how to do an accelerated stall correctly, it’s a lot quicker than I originally thought. I’m not so scared anymore of them. We head back in and do 2 landings. My radio skills are a lot better now. I don’t look at my instructor for approval anymore. And I even noticed that for the taxi when she took over I was disappointed because I wanted to do it and knew what I was doing. My first landing was a bit fast and I felt it. We had a crosswind coming from the left and I was just pretty high coming down. It wasn’t a bad landing though but after yesterday it felt like a step back. The second landing was better. Well, worse in some ways. I wasn’t on the center line but I was still straight down the runway. I figured out the crosswind correction better. The speed was correct and my flare was better. The touch down wasn’t as hard as the last one. We got off the runway pretty quickly and taxied back fine. My taxing is getting better too, I’m getting better at keeping that center line and not over controlling the plane. We went into the classroom afterwards and she said I’m 1-2 lessons away from soloing. I’ll take my pre-solo test next lesson (she wanted me to do it today but I have to get to a meeting!) and then a progress check with another instructor. I’m excited but not excited about being grounded May 3rd-13th due to the planes being gone. I’m exhausted and still have work tonight! 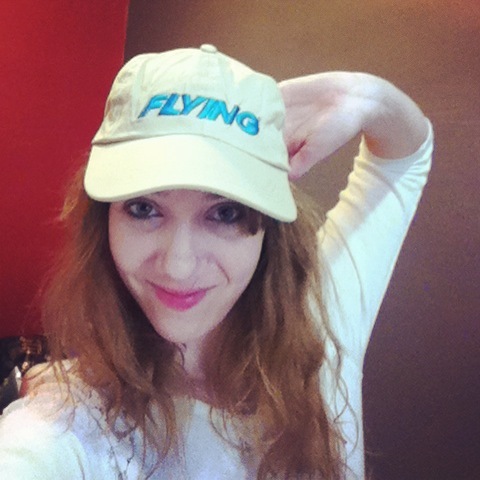 But coming home, I got an awesome hat that I’ll never wear from “Flying” magazine in the mail. I decided to try my best to model it, I’m definitely not a model.